Apple’s in-built instant messaging service, iMessage allows the iPhone users to send pictures, text, location, videos and audio to other iPhone users by using either Wi-Fi or cellular data to send them. All your text messages are automatically saved on your device but what if something unexpected happens with no available backups? You may lose important conversations as you haven't backed up those messages. You might also lose the messages and attachments due to accidental or manual deletion. So, it is important to back up iMessages in advance. Backing up all your data in iPhones is fairly simple which can be done using either iTunes or iCloud. However, iPhone users might find it a daunting task to back up and restore using iCloud. No matter how advanced the phones are it is important to backup the data, so that you can recover it when your device fails. Most of them may choose iCloud to back up the data but there are some disadvantages of iCloud you may have encountered. Apple only offer free 5 GB to store data in the iCloud. You can use an alternative to store data if you don't want to spend on storage or it is hard for you to remember your Apple ID and password. Apart from official ways of backing up your iMessages, there is an advanced tool to backups your iMessages separately. iMyFone D-Back is capable of backing up iMessages easily without iCloud in a safe and secure manner. Follow the steps if you want to backup iMessage without iCloud quickly and efficiently. You can backup iMessage from iPhone with no storage limitation. You can view iMessage within this backup whenever you want. You can backup iMessage without affecting your previous backups. You can selectively or fully backup your iMessages. 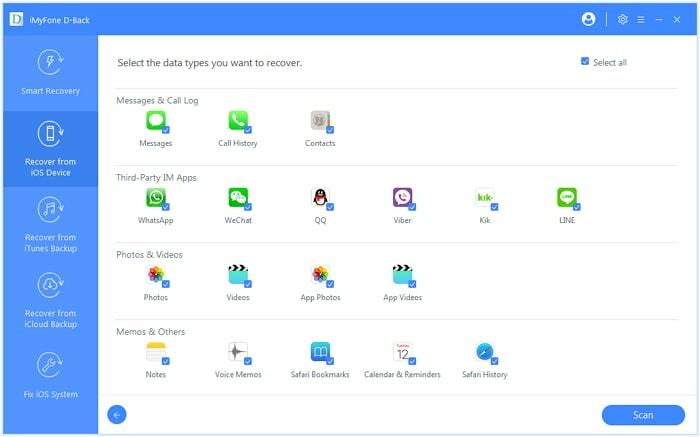 More than 18 data types are supported, including videos, message, contacts, WhatsApp, call log and etc. 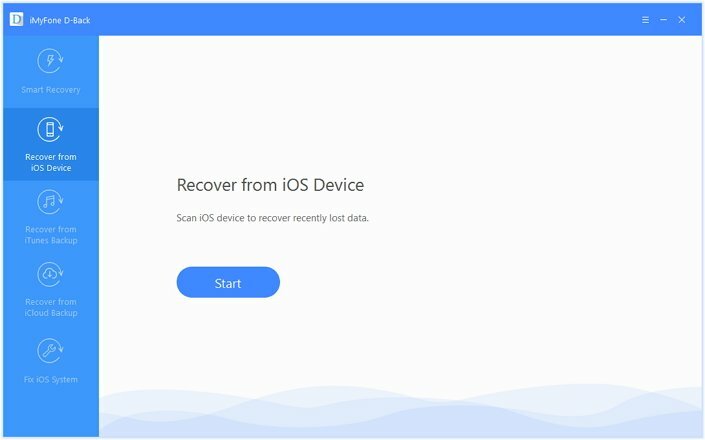 Step 1.Launch D-Back on your computer and select “Recover from iOS Device”. Click “Start”. Step 2.Connect your device using the USB cable. When the program detects your device, click “Next”. 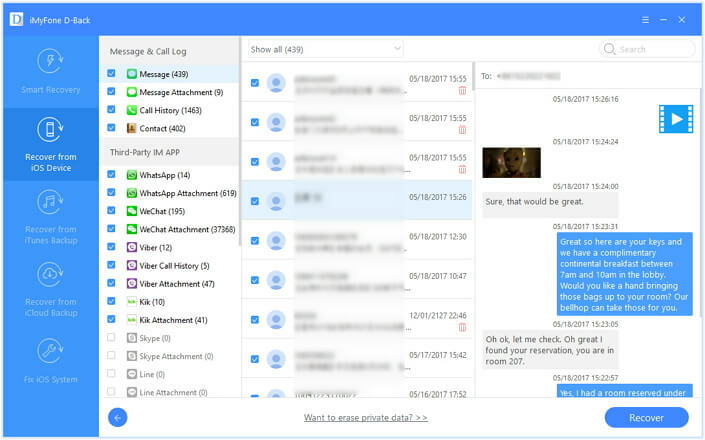 Step 3.Choose “Message” under Message & Call Log from various file types displayed. Click “Scan”. Step 4.Once the scanning is completed, all the messages and iMessages will be displayed on screen. Choose the messages you want to recover or select all the messages to recover and then click “Recover”. You will be asked to choose the desired folder for saving the iMessages in your computer. In just a few minutes, your iMessages will be backed up in your computer. One of the most important benefits of D-Back is you can take a backup of only iMessages you want. As you are not creating a backup of entire data of your iPhone, you are saving a lot of storage space. Unlike iCloud, there is no storage limitation of D-Back. One of the alternatives for backing up the iMessages is using iTunes. If you are facing the above issues, iTunes backup is one of the best options for backing up and restoring the iMessages. Let’s see how you can do it in simple steps. Step 1. Open iTunes on your computer. Make sure that you have updated it to the latest version. Step 2. Connect your device using the USB cable. Enter the password if prompted. Step 3. 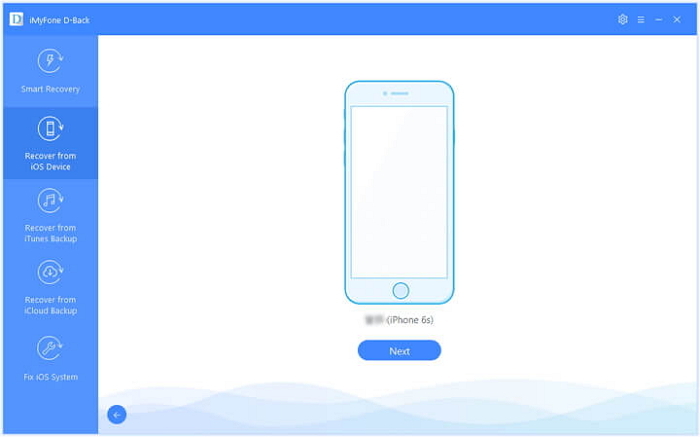 Select your device that appears in iTunes. Encrypt your backup if you want to save your Health and Activity data from Apple Watch or your iPhone. Step 4. 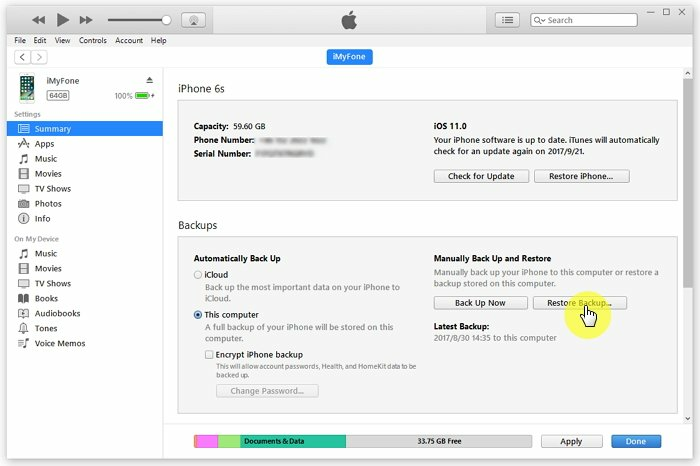 If you don't want to save additional data, just click “Back Up Now” under Backups. The backup process will begin immediately. Step 5. Once the process is completed, you can find your backup under “Latest Backup” with updated date and time. Your device’s entire data including iMessages will get backed up in iTunes. The advantage of using iTunes backup is that it is free to use. However, you cannot view the iTunes backup content. Having a backup of your iMessages is very important because they can get deleted due to various reasons like formatting error, bricked iPhone, accidental deletion, lost or damaged phone, etc. You can use any of the backup methods explained above. Do not miss the best alternative of iCloud - iMyFone D-Back which offers free trial version before purchasing. You can compare both of the ways of creating iMessages backup and then decide which is suitable for you. Or, if you have any other simple way, you can mention them in the comments below. We will be happy to know about them.